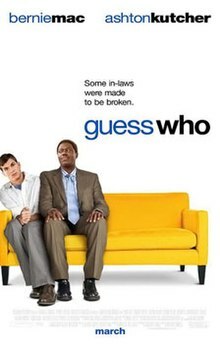 Guess Who is a 2005 American comedy film about race relations directed by Kevin Rodney Sullivan. It is a loose remake of Guess Who's Coming to Dinner, a film about a black man marrying a white woman. This film instead focuses on a black woman marrying a white man. The film stars Bernie Mac, Ashton Kutcher, and Zoe Saldana. The majority of the film was filmed in Cranford, New Jersey. Theresa Jones (Zoe Saldana) takes her boyfriend, Simon Green (Ashton Kutcher) home to meet her parents on the occasion of her parents' 25th wedding anniversary, planning to reveal that they are engaged. However, what Theresa has also left out is that Simon is white. Her father, Percy (Bernie Mac), dislikes Simon almost immediately because of his race. Wishing to impress Percy, Simon lies to him about being a NASCAR pit driver for Jeff Gordon, not realizing that Percy is one of his biggest fans. After catching Theresa and Simon in a compromising position, Percy tries to force Simon into a hotel, but all the hotels in town are booked. Instead, he allows Simon to sleep in his basement on the couch, where Percy also sleeps. With the help of his personal assistant Reggie (RonReaco Lee), Percy tries to dig up as much dirt on Simon as he can as well as creating the ideal black boyfriend for Theresa instead of revealing her boyfriend is white. He manages to get Simon to reveal that he lied about being a NASCAR driver and also that he needs a $50,000 loan. Simon discovers Percy's lies just as Reggie reveals that Simon quit his job. Immediately, Percy goes to tell his daughter this new information, however Simon claims he wasn't fired and instead quit. Angry that he didn't tell her the truth, Theresa leaves while Percy's snooping and plagiarism of his vows temporarily strains his relationship with his wife, Marilyn (Judith Scott). The next morning Percy and Simon find the women to apologize, but while Marilyn and Percy reconcile, Simon and Theresa break up and he leaves. On the day of his anniversary, Theresa tells her father that she and Simon were going to get married. After wondering why a man planning to get married would quit his job, Percy realizes that Simon quit his job due to his boss' disapproval of interracial relationships. Percy goes after Simon and brings him back to Theresa where they get back together, then the festivities begin. The film's working title was The Dinner Party. At one point, Harold Ramis was slated to direct. According to Box Office Mojo, the film earned $68,915,888 domestically and another $32,950,142 internationally, giving it a total gross of $101,866,030 worldwide. Guess Who gathered mixed reviews, earning a 43% rating on Rotten Tomatoes, with the final consensus stating that "Despite the chemistry of its stars, Guess Who, a lacks the political relevance of the original." said of the film, "A succession of tired race jokes made worse by the bad comedic timing of the bland, under-talented Ashton Kutcher", The Wall Street Journal said, "Guess Who is, impurely and simply, a comic premise borrowed, turned around and dumbed down to the level of sketch or sub-sketch humour" and Rolling Stone said, "Guess what? It's almost bearable". More positive reviews included The Baltimore Sun, which said, "The movie's sweetness, wit and charm go beyond its can't-we-all-just-get-along premise". ^ Friend, Tad (19 April 2004). "Comedy First: How Harold Ramis's movies have stayed funny for twenty-five years". The New Yorker. Retrieved 28 May 2015. ^ Sragow, Michael (2005-03-25). "Dream Pairing". Baltimore Sun. Retrieved 2018-03-19.